Bathymetric surveys were conducted by the U.S. Geological Survey, in cooperation with the Missouri Department of Transportation, on the Missouri and Mississippi Rivers in the vicinity of 12 bridges at 7 highway crossings near St. Louis, Missouri, in October 2010. A multibeam echo sounder mapping system was used to obtain channel-bed elevations for river reaches ranging from 3,280 to 4,590 feet long and extending across the active channel of the Missouri and Mississippi Rivers. These bathymetric scans provide a snapshot of the channel conditions at the time of the surveys and provide characteristics of scour holes that may be useful in the development of predictive guidelines or equations for scour holes. These data also may be used by the Missouri Department of Transportation to assess the bridges for stability and integrity issues with respect to bridge scour. Bathymetric data were collected around every pier that was in water, except those at the edge of water or in extremely shallow water, and one pier that was surrounded by a large debris raft. Scour holes were present at most piers for which bathymetry could be obtained, and ranged from 0 to 16 feet deep except at piers on channel banks or those near or embedded in rock dikes. Scour holes observed at the surveyed bridges were examined with respect to frontal slope and shape, and scour holes near railroad bridges in the vicinity of the highway bridges also were examined. Although exposure of parts of foundational support elements was observed at several piers, the exposure likely can be considered minimal compared to the overall substructure that remains buried at these piers. At piers with well-defined scour holes, the frontal slopes of the holes ranged from 1.70 to 2.94 feet per foot (computed as run over rise), which were similar to recommended values in the literature (generally ranging from 1.0 to 2.0), and the shapes of the scour holes were not substantially affected by the movement of sand waves into the holes. Spur dikes near several of the piers caused localized flow disturbances that caused the resultant scour holes to display characteristics of skewed approach flow. The channel bed in the 2010 surveys was as much as 16 feet lower than the channel bed at the time of construction at the two oldest surveyed bridges, and the range varied with age of the structure, indicating the channel-bed elevations have lowered with time. However, other research has indicated the extremely dynamic nature of the channel bed on the Mississippi River. The size of the scour holes observed at the surveyed sites likely was affected by the low to moderate flow conditions on the Missouri and Mississippi Rivers at the time of the surveys. The scour holes likely would be larger during conditions of increased flow. Artifacts of horizontal positioning errors were present in the data, but an analysis of the surveys indicated that most of the bathymetric data have a total propagated error of less than 0.33 foot. Part or all of this report is presented in Portable Document Format (PDF); the latest version of Adobe Reader or similar software is required to view it. Download the latest version of Adobe Reader, free of charge. 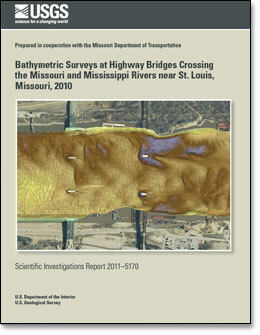 Huizinga, R.J., 2011, Bathymetric surveys at highway bridges crossing the Missouri and Mississippi Rivers near St. Louis, Missouri, 2010: U.S. Geological Survey Scientific Investigations Report 2011–5170, 75 p.